Inside: Learn How to Make This Super Easy, Authentic Flan Napolitano Recipe with a perfect texture. Although Mexico has many delicious dessert recipes, flan napolitano is probably the most popular. Every time that I make this recipe for friends and family, they ask for the recipe. It is important to have a smooth and creamy texture, so make sure you follow the instructions exactly as described. If there is one dessert that I miss from Mexico, it is definitely flan. 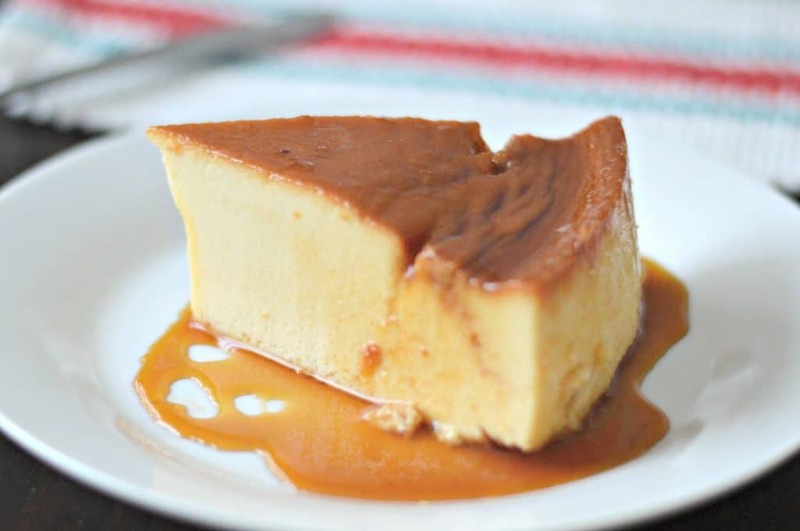 Growing up in Mexico, we always looked forward to the days where my mom would make flan. As soon as I walked into the house and saw her making it, my siblings and I got so excited to eat it. What Does Flan Taste Like? Some people don’t like flan, because they have had a version that isn’t very creamy and has an odd texture. However, when made correctly, it has a smooth, creamy texture and the flavors are amazing. I would describe the texture as very similar to a cheesecake, but the flavors are pretty different. Whenever I am asked to take a dessert to a dinner with friends or family, this recipe is at the top of my list. It doesn’t take very long to make, but everyone is always impressed with the presentation and the different flavors. 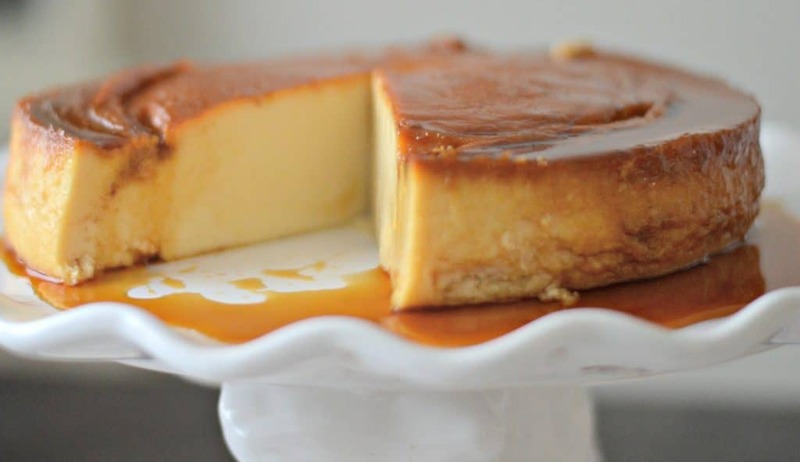 What Ingredients Do You Need To Make Flan? You will also make a delicious homemade caramel sauce using just sugar. As you can see, these ingredients are very common, so there is no excuse not to make this! 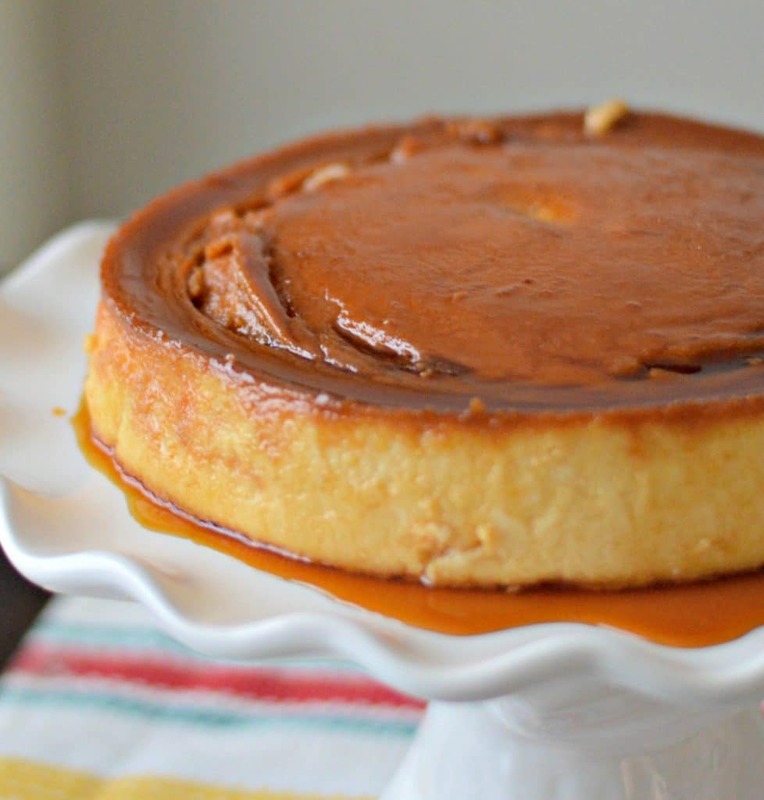 Many people shy away from making flan because they think it is too hard. I am here to tell you that you can make it, and this easy version will ensure it turns out right. You can take comfort knowing that you are having a very traditional, Mexican dessert that is delicious and great for serving a crowd. Let me know in the comments below how this recipe turned out for you, and don’t forget to leave a review! 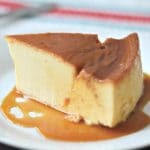 This super easy flan recipe is the perfect texture, tastes great, and is sure to please a crowd. Add to the sugar to a frying pan over medium heat, stirring constantly for about 4-8 minutes, or until it becomes a liquid. Add the caramel sauce made in the previous step to a metal cake pan (9 inches) distributing it along the bottom. Let cool for a couple of minutes. Combine all of the ingredients for the flan in a blender and blend until smooth. For the double boiler method that I use, you will need a large steamer like This One. This is used for tamales as well. Fill the lower part with water and bring to a boil. Add the steamer insert and place the cake plan with the flan mixture inside and cook for 1.5 hours, checking often. I made this flan for my New Years Eve party. It was a huge hit! Everyone said it was the best flan they had ever had. Thank you for this recipe, it will be made many times. I also have to say it was by far the creamiest flan I have ever eaten. Yes Meg you can make this in the oven. I have made this same flan for over 30yrs and I’ve always made it in the oven. Just make sure you put your flan pan into a bigger pan, fill the bigger pan with hot water until it comes about half way to the outside of your flan pan and bake at 350 for about an hour. Hi Dennis – it should be a standard 8 Oz bar of cream cheese. Yes, it should be at room temperature to make it as easy as possible. I will update the recipe to clarify both of those points. Thanks! Hi Letty – Media Crema can sometimes be found with the name “Table Cream”, produced by Nestle. This is what it looks like: https://amzn.to/2BrxbFp. You can also find larger bottles of it in the hispanic refrigerated section if your store has one. Hope that helps. Hi. I just want to know the equivalents of the liquid ingredients in milliliters or maybe in cup? I don’t exactly know how big the cans are . Thanks. Hi Eunice – for the Media Crema, the can is 225 Ml., the sweetened condensed milk is about 400 Ml, and the evaporated milk can is about 350 ml. Hope that helps! Do you cover the double boiler? ?